Just like people, your pet can develop dental problems. These painful and potentially life-threatening oral conditions can be prevented (or at least halted) through a regular pet dental care routine. This routine will include a home routine that includes daily maintenance, and a visit to the vet once per year for a professional check-up. Working together hand-in-hand, this oral health routine for your pet will provide a better quality of life for everyone. It may seem a bit silly to think that a bit of bad breath could be cause for alarm, especially something potentially fatal. However, if your pet has a foul odor from their oral cavity this can spell trouble not just for their teeth and gums, but also for their internal organs. When gum disease is in late stages there are toxins and bacteria produced that pose a considerable threat to your pet’s organ health. These toxins enter the bloodstream through various channels in the infected oral cavity that directly impact the health of the rest of the body. Over time these toxins can cause serious disease and even death if not properly treated. As you might suspect, gum disease is very painful for your pet. The problem is that they will rarely show you any indication of this pain as they instinctively hide pain to avoid looking weak or unfit. Even so, they may be silently suffering from oral health issues that can often be fixed by establishing a pet dental care routine. Taking care of your pet’s oral health may seem a bit odd. After all, not many people consider that brushing the teeth of their pet is an essential part of daily pet care. When you consider that your pet can suffer from the same oral health diseases as you can if you never took care of your mouth, a new perspective begins to arise. Ideally, start an oral health routine from an early age. Starting regular yearly dental exams as early as six months of age is entirely appropriate. In addition to these yearly professional visits is the responsibility to establish a home care routine as well. Daily brushing with a special pet toothbrush and toothpaste as well as using fun chew toys and good food can dramatically improve the overall health of your pets oral health – for many years to come! When it comes to providing your pet with the best care possible, an oral health routine should be near the top of the list. Pet dental care plays a fundamental role in your pet’s quality of life, overall lifespan, and overall well being. 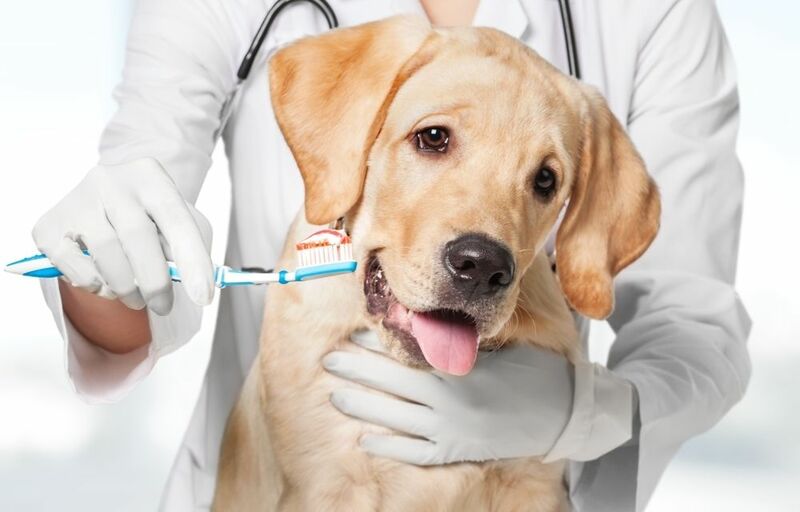 Allotting time to daily brushing and scheduling regular yearly dental appointments is your best defense against painful (and potentially fatal) oral health problems in your pet. Most of all, you can rest assured that your pet is not silently suffering in pain and is enjoying every day with you. Contact our practice and schedule a consultation with our vet to know more. Noticing that your pet is in pain will allow you to get your pet the attention he or she needs so badly. Read this blog to learn more of signs of pain in pets. Dental treats are not only a special way to spoil your beloved pet. They can also be extremely effective at supporting his long-term dental health. However, with so many to choose from, what is the best dental treat for dogs? How Can I Clean my Dog’s Teeth? Elko Veterinary Clinic shares some guidelines on how to clean your dog's teeth. To know more, call our Elko, NV office at 775-204-0400 today! Get to know the importance of dental care for your pets. For more information, contact us at 775-204-0400. Know more about some tips on taking care of your senior pets. For more information, call us today at 775-204-0400. Learn more about some important guidelines in knowing whether or not your pet has cancer. For details, call 775-204-0400 today. What Are Safety Measures For Keeping An Outdoor Pet Cat? Learn more about some tips on how to keep your pet cat safe outdoors. For more information, contact us today at 775-204-0400. Know the importance of having a pet emergency kit in case the unthinkable happens. For more information, call us at 775-204-0400 today! Know some guidelines on how to completely snake-proof your home. For more information, contact us at 775-204-0400 today! Know about the benefits of spaying and neutering your pet. For more details, call us at 775-204-0400. Know more about some guidelines on how to keep your pets safe from ticks. Call us at 775-204-0400 for more information. What is a Healthy Diet for a Dog? Learn more about the guidelines on how to give your dog the best possible diet. For more information, call 775-204-0400. There are many different ways to train your dog. Read the common mistakes responsible pet parents should avoid making. Contact Elko Veterinary Clinic for more information. The safety of your pet is just one of your responsibilities when you choose to bring an animal into your home. Read about the list of outdoor dangers for your pets at Elko Veterinary Clinic.